and with this outfit I can say done, done & done! Since throwing the white jean rules out the window back in January, I am loving white jeans as a transition piece from Spring into Summer. This new swingy H&M top and space-age cool sandals are the perfect anchors to spice up this simple ensemble. And no, you aren't seeing spots, polka dots just happen to be my go-to pattern (more here & here)! What are you using to jazz up your go-to favorites these days? So cute, I always love polka dots! And omg that diy is amazing, I'm going to try that! great outfit - so simple and chic. And your pug is so cute! ooo, I love those sandals!! Your top is so cute and I love the metallic sandals, such a fun look :) and oooo I want to watch the 5 year engagement, it looks so funny. Thank you, all about the Tide-to-go pen... it is the reason I can wear white! Hey doll, thanks for swinging by my blog! Love yours; you've got great style. Polka dots are my fave too! Playful but not harsh, a perfect pattern. Thank you - the necklace was my easiest DIY yet! Love the feel of this outfit and the new shoes are such a good find! Thank you! Yes, Emily Blunt is adorable in the movie... totally worth it just for her! Thank you! I hunted for these for ages too... and now Old Navy has the cutest pair... might have to stock up incase I stain these! I do deal in polka-dots quite frequently... Target had some cute options last time I was in! Your polka dot top is so cute! I can't stop wearing my white jeans, they are so perfect for spring. I'm dying to see The 5 Year Engagement. Jason Segel is always hilarious! You should check out Old Navy too... cute and affordable white jeans! Love that fight scene... Elmo says... hahaha! I've been loving on white jeans too lately! I went back & forth between buying white or pale yellow skinnies at American Eagle & I went with the yellow because white brought back too many bad 80's memories. But I've been seeing them all over the blogosphere lately so I'm kinda kicking myself. The yellow ones are great too but now I want white ones also!! You look great. I'm a sucker for polka dots too. I love polka dots. I love white jeans. I LOVE this outfit on you. So 5 Yr Engagement was good? I adore Emily Blunt and would see the movie just for her. I'm on the search for the perfect pair of white jeans. I'll have to check out the J-Crew ones! The top is perfect and your look so cute!! I also seen the 5 Year Engagement and thought it was great! That fight scene was just too funny! Nice! 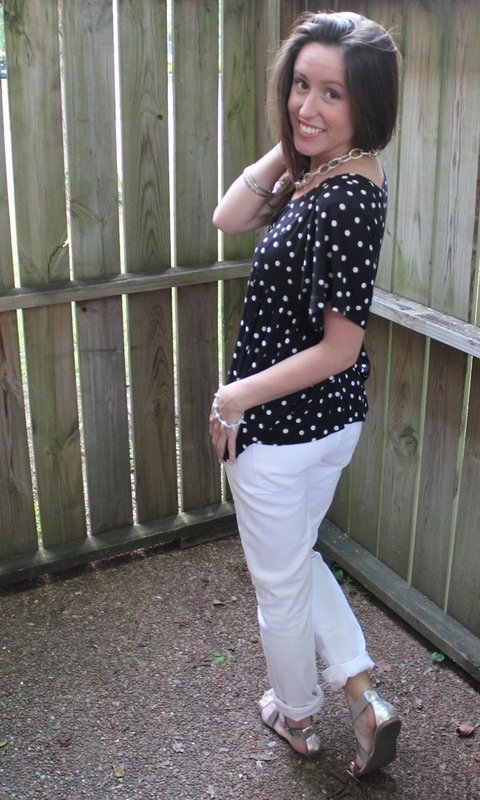 Loving the polka dot top and white jeans! I just got my first pair of white jeans after hunting for literally years for the right pair. Yours look great! Cute look! Loving your sandals!! This polka dot blouse is just perfect! I love the metallic sandals paired with the outfit. I just bought a polka dot dress at F21.... can't wait to wear it! I love the pic of you and Doug, and you look great in white jeans! 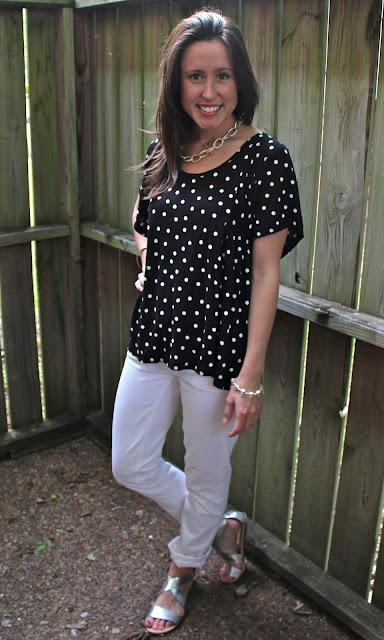 Love the polka dot top and the metallic flats!! Super cute and summery. I love this entire outfit and I've been on a search for silver shoes! Love these! Heading out to my nearest H&M to find them.